Well, I did. I finally got to meet Lance Gaebe, the State Land Commissioner, and he shared with me the process he and the Board go through in leasing minerals that lie under state-owned land. Here’s how it works. The State Land Department—actually its name has been changed now to the Department of Trust Lands—owns about 2 ½ million acres of minerals, and much of the land above those minerals. They’ve actually, over the years, sold off some land, but retained the mineral rights under the land they sold. About 800,000 acres of those minerals are leased to mineral development companies, who pay the state a bonus to get the right to drill for oil, mostly. If they hit a producing well, which is almost always, they pay the state a share of the proceeds from the well. The state came by those acres at statehood, when the federal government gave the state the land and minerals in sections 16 and 36 in every township—two sections out of every 36—making the State Land Department North Dakota’s biggest landowner. Those lands were given by the federal government “for the support of schools,” and they are known as “school sections,” and the revenue derived from them is used to support education in North Dakota. So along comes an oil boom. Representatives of oil companies are scouring courthouse records looking for mineral rights available for lease, so they can drill oil wells. When they find a section of land which might have oil potential, and under which the minerals have not been leased by anyone, they go to the owner and offer some money to lease the minerals, promising a share of the riches if they hit oil. If it turns out those minerals are under a “school section,” they tell Land Commissioner Lance Gaebe they want to lease those minerals. Lance’s job is to maximize the income from those lands when they are leased, so instead of negotiating a price, he holds an auction. The auctions are held four times a year. The lands identified by the oil companies are considered “nominated” when the companies offer an opening bid before the auction, generally a dollar an acre for 5 a year lease. When the sale starts, the opening bid has been made, and anyone else is free to bid on them. Generally, other oil companies bid against the “nominator” and bidding continues until everyone but one bidder drops out. At the February auction I referenced earlier, the bids on about 68,000 acres of mineral rights brought the state $84 million. Yes, you read that right. 84 million dollars were collected to help support our schools. In one day. Not a bad day for the school kids of North Dakota. But at what price? The net effect is that there will be hundreds of new oil wells drilled in western North Dakota, adding to the confusion and congestion that already exists there. At the same time the state is trying to get a handle on the rapid development, we’re handing out new drilling opportunities like candy (albeit pretty expensive candy) to anyone who asks for them. Anyway, as you read in my earlier post, and in the news stories in late January and early February, some of those lands nominated by the oil companies for the Department’s quarterly sale this past February were in, or adjacent to, the U.S. Forest Service’s few remaining roadless areas of the Bad Lands, areas that are being considered as additions to the nation’s official Wilderness system. 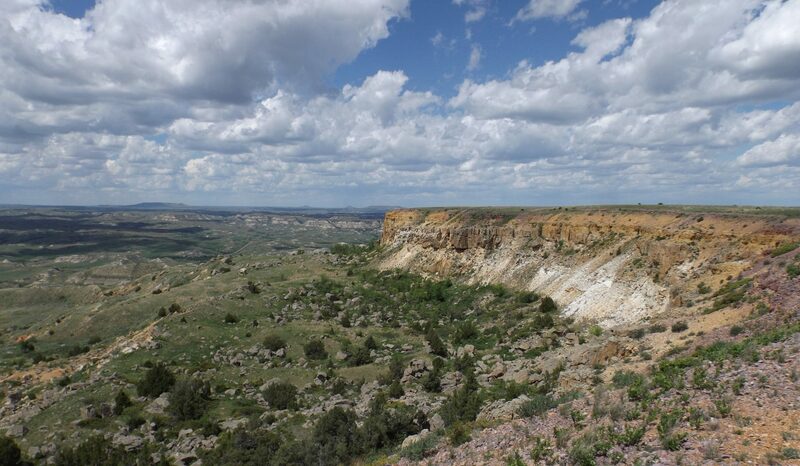 There are not many spots in the Bad Lands that remain pristine, outside of Theodore Roosevelt National Park (most of which is really not pristine because it has roads, campgrounds, picnic shelters and other amenities which allow tourists to enjoy it). Altogether, there are just a little over 60,000 acres of roadless areas left in the Bad Lands, about a hundred square miles, or an area just ten miles by ten miles. That’s it. Out of millions of acres of Bad Lands, only a tiny fraction remains free of civilization. Hikers, horseback riders, backpackers, photographers, birders, and others who just enjoy nature have only those few small spots left where there are no oil trucks roaring past them as they visit these spots. A couple of weeks after I received the list, I received an e-mail from Drew Combs, the Director of Minerals Management for the State Land Department (and one of the most helpful and respectful state employees I’ve met in a long time) that directed me to the Land Department’s website for the final, up-to-date list of tracts to be sold at the May 1 sale. In the two weeks between the time I received the preliminary list from Gaebe and Combs’ e-mail, the tracts in or near the roadless areas, as well as the wildlife habitat areas identified by the Game and Fish Department, had been removed from the list. So I inquired of Combs what had happened to make them disappear from the list. He replied that because of all that had taken place regarding those parcels, and with the new wildlife stipulations being placed in the leases, he thought he better call the company that had nominated those tracts and see if they were still interested. Well, it turns out they weren’t interested any more. Combs said the company who nominated those 2,500 acres, Blanca Peak LLC of Dickinson, had submitted an opening bid of $100 per acre when they sent in the nomination, and they had decided to save the $250,000 it would cost them for the leases. Well, it turns out it may not have been that simple. Blanca Peak is fronting in North Dakota for Chesapeake Energy, the notorious Oklahoma-based oil and gas firm that is facing hundreds of millions of dollars in lawsuits around the country (read about them here) for fraudulent leasing practices (You can read how they screwed a 92-year-old widow here). It’s hard to tell from my research just who owns what, but it looks like a company called Redsky Land out of Edmond, OK, which does mineral leasing for Chesapeake, put together a storefront operation in Dickinson called Blanca Peak, which leased a couple thousand acres, mostly in Billings County, in February (and would have leased the 2,500 acres we’re talking about here if they had been offered). Another company which I believe is also fronting for Chesapeake, Clear Creek Resources, has leased nearly 10,000 acres of state school lands, mostly in Billings, Golden Valley, Stark and Dunn Counties, spending more than $10 million here. I asked Combs if he had received payment from the two companies, and he said he had. That’s a good thing, because a lot of people who leased land to Chesapeake or one of its subsidiaries got screwed, and one of the biggest screwees is a fellow named Harold Hamm. You might recognize that name—owner of Continental Oil, the biggest player in the Bakken. Hamm didn’t get screwed for long, though. Forbes Magazine reported that the billionaire Hamm took Chesapeake and its own billionaire owner, Aubrey McClendon, to court, and won a $20 million settlement. You can read about it here. Hmm, hard to choose a side in THAT fight, eh? Chesapeake made news in North Dakota recently when it announced it was essentially stopping its drilling activities here and cancelling most of its private leases in southwestern North Dakota. There’s going to be lawsuits over that as well—just not quite as big as the one filed by Hamm. A lot of landowners did not get their lease money, and they’ve banded together and hired an attorney to try to get it for them. That news prompted Governor Dalrymple a couple weeks ago to tell sportsmen gathered at the Conference on the Future of Hunting that “in southwest North Dakota, (oil) development is not going to be what people thought.” That was part of his reassurance to hunters that the oil impact on hunting is not such a big problem. Well, translating Chesapeake’s bailing out into a clear sign that oil activity in the part of the state in which Chesapeake was working is a real stretch. It’s likely more about Chesapeake and its problems than it is about the future of the oil industry there. And it may also be why they have decided not to lease the school sections in the roadless areas. Everyone listening to the Governor took that to mean that when the Industrial Commission’s Oil and Gas Division is issuing drilling permits on private land in North Dakota, they will first check with Game and Fish and see if a newly-drilled oil well would affect wildlife. Wow. That’d be something. Except it’s not what it sounds like. What it turned out to be, at least so far, is that on private land under which the state owns the minerals (land that used to be owned by the state but was sold to a private landowner, with the state retaining the minerals), there’s going to be a bit of a process to see if wildlife is affected. That’s a tiny, tiny fragment of the drilling permits to be issued. So, what now? What should the state be doing in the face of this mad march across our landscape? I read a month or so ago the report the Governor issued about the tour his agency heads took across the Bakken, and how we’re going to address that by appointing an Energy Impact Coordinator and spend some money helping with roads and schools and housing and law enforcement and social services (it does not address landcape, wildlife or environmental problems). You can read the report here. The problem with that report is that it addresses the effects of unmanaged oil development, not the cause of the problems. The cause is too much development, too fast. Pretty much everyone agrees with that. So let me offer a modest proposal. Let me suggest that it is time for the State Land Board to quit leasing its minerals for a while. Let me suggest that we could slow down development just a little bit if we didn’t keep making more land available for drilling. I think a three-year moratorium on further leasing of state school lands is in order. If you’ve read this far, you are getting the picture that what is happening here is just too much for anyone to keep track of. It took me a week to write this story, and I wanted you to read this whole story in one big gulp to get some idea of what is happening in our state, and how fast those things are happening, and how interconnected everything is. I just went back and re-read it and I am shaking my head in near disbelief. A moratorium on leasing of state school lands doesn’t immediately stop any of the problems we face. But it is a sign of good faith on the part of our government that we recognize we have a problem and we need to try to get a handle on it. There are some natural ecological benefits to doing it—school lands in oil country are pasture lands, mostly native prairie, and so the effect would be to preserve some native prairie, which is wildlife habitat. A moratorium will give the Game and Fish Department time to go out and physically inventory the school lands and determine which should be protected and which should be drilled in the future. My guess is that they would welcome that timeout. Their job is to take care of our wildlife, and state school lands are home to a lot of wildlife. But it’s the bigger picture that is more important. It’s government expressing its concern, telling its citizens that we see a problem and we’re going to start taking some steps to address it. We’re not going to lose any money over it. The oil isn’t going anywhere. It will still be there in three years, or whenever we decide to renew our lease program. Besides, we don’t need the money now anyway. We’re rich. The state’s bank vaults are overflowing with cash. Leaving the oil alone for a few years is just like more money in the bank. It’ll be there when we want to go get it. And so, thanks to Mike McEnroe. He spotted a problem, he called attention to it, and he got results. For those of us who value those precious wilderness areas, he’s a hero. Thanks to Governor Dalrymple and the State Land Board and Lance Gaebe and Drew Combs and the North Dakota Game and Fish Department, especially Conservation Division Chief Greg Link, and yes, even to Blanca Peak LLC and Chesapeake Energy. So far, we’ve got a happy ending to this one small story. Now, let’s deal with the big story. If we are going to talk about the loss of wildlife and habitat we should also be discussing the loss and destruction of our cultural resources. We are losing our North Dakota history and destroying what is sacred to the Native Americans and their story in the landscapes. We are losing our roots. The Stark County lawsuit in place against Chesapeake Energy filed in 2012 is huge. Very interesting suit. Involves several hundred thousand acres of oil and gas minerals.